Tickets are still available to see husband-and-wife political commentators James Carville and Mary Matalin in the Maverick Speakers Series. The duo will present "All’s Fair: Love, War, and Politics" at 7:30 p.m. Monday, Oct. 20, at Texas Hall. An autograph signing follows the lecture. James Carville, a prominent figure in the Democratic Party, and Mary Matalin, a consultant for the Republican Party, are known for their stimulating, candid, and entertaining take on politics from both sides of the political aisle. They are co-authors of Love & War: Twenty Years, Three Presidents, Two Daughters and One Louisiana Home. Tickets also are available now to see James Stavridis, retired Navy admiral, at 7:30 p.m. Tuesday, Nov. 4, at Texas Hall. An autograph signing will follow the lecture, "Sailing the Cyber Sea: The New Realities of 21st Century Security." UT Arlington continues to monitor developments related to reports of Ebola virus cases in the United States. The health and safety of the University community is of utmost concern. UT Arlington is not aware of any Ebola-related illness within the University community and is maintaining close contact with regional, state, and federal health officials to ensure that the University has the most current information available. The University maintains protocols and supplies necessary to enable a rapid and effective response to potential threats to the health and welfare of our community. Read more about UTA's Ebola health advisory, travel requests, and more. Fearless, unrelenting, and passionate, UTA professor and filmmaker Ya’Ke Smith has emerged as a major force in independent cinema. In its cover story, the fall 2014 issue of UTArlington Magazine examines Smith’s evolution as an artist and the success of the UTA film program. You’ll also find a look at the many Mavericks playing Major League Baseball, the University’s groundbreaking Asian EMBA, and the potentially life-saving research of Daniel Armstrong, Robert Magnusson, and Kytai Nguyen. Every article includes a link for posting comments. You also can “like” the magazine’s Facebook page and get updates in your newsfeed. 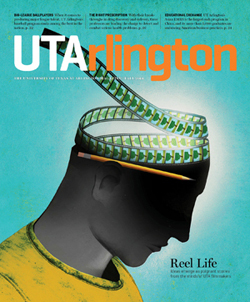 UTArlington Magazine is published three times a year and distributed to about 160,000 UT Arlington constituents, including all alumni, major donors, elected officials, civic leaders, faculty, senior staff, and other friends of the University. The Environmental Protection Agency recently recognized UT Arlington’s efforts to reduce food waste and prevent tons of refuse from ending up in landfills each year. The EPA’s Food Recovery Challenge program gave its Award for Leadership to UT Arlington’s Office of Sustainability. UT Arlington was one of the first of 50 U.S. colleges and universities to join the Food Recovery Challenge, a food waste reduction initiative. The main focus of UT Arlington’s food recovery program is a successful composting effort since 2005. Volunteers and staff have steadily increased the amount of food waste collected and composted from campus dining services and off-campus coffee shops and hospitals, as well as yard waste from University grounds crews. About 68,000 pounds, or 34 tons, is composted each year. Read more about UTA's Food Recovery Challenge. Plan now for UT Arlington’s Homecoming 2014, a weeklong celebration Nov. 17-22, featuring a parade, street festival, pep rally, basketball game, fireworks, and more. On Saturday, Nov. 22, expect a busy time with a golf tournament, 5K walk/run, a street festival, and reunions. The Homecoming parade and pep rally lead up to the big game when the Maverick men’s basketball team plays Houston Baptist in College Park Center. A fireworks display follows. New to the lineup this year is the annual Distinguished Alumni Awards on Friday, Nov. 21. Other Homecoming events include Paint Your Ride with Maverick Pride car decorating, a step show, The Bash, and a chili cook-off. Register your student organization for the Homecoming Parade. 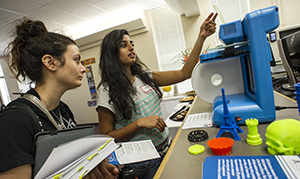 Manar Kawasmi, left, biochemistry junior, learns about 3-D printing from Amaraja Dalvi, industrial engineering graduate student, at the UTA FabLab in the Central Library. The fabrication laboratory opened last Wednesday. The Graduate School Expo, formerly known as GradFest, brings advanced degree information to anyone considering graduate or professional school. The event is Wednesday, Oct. 15, in the E.H. Hereford University Center. Meet with representatives from UT Arlington's graduate programs and other Texas colleges and universities at the graduate and professional school fair 10 a.m.-2 p.m.
A free GRE and GMAT Practice Test and Strategy Workshop is 10 a.m.-2 p.m. Saturday, Oct. 18. Register with Kaplan at the Graduate School Expo. 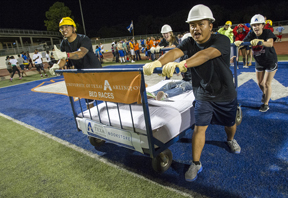 Teams rolled out for the 34th annual Bed Races at Maverick Stadium on Thursday night. See more photos. Texas state Sen. Kelly Hancock will discuss issues relevant to Arlington and UTA at a town hall meeting at 5:30-7 p.m. Tuesday, Oct. 14, in the Bluebonnet Ballroom of the E.H. Hereford University Center. Hancock represents District 9, which includes UT Arlington. Listen to both sides of tragedy and forgiveness at a screening of Beyond Right and Wrong at 2 p.m. Wednesday, Oct. 15, in Room 100 of Nedderman Hall. This life-changing documentary explores the intersections of justice and forgiveness as survivors heal from these tragedies. From the Rwandan genocide to "The Troubles" in Northern Ireland to the Israeli-Palestinian conflict, people from different sides of the violence share their stories—their anger, remorse, pain, and paths to recovery. Director and executive producer Lekha Singh will discuss the film and answer questions after the screening. A fine arts photographer, she contributed to National Geographic's The Other Side of War: Women's Stories of Survival and Hope. Read more about Beyond Right and Wrong. The free screening is sponsored by the Office of the President and University College. 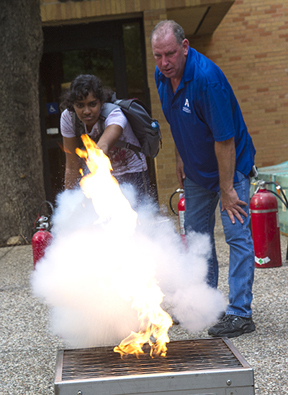 Stenila Simon, left, aerospace engineering freshman, learns how to use a fire extinguisher from Bruce O'Keefe at the National Night Out event last Tuesday evening. O'Keefe is fire and safety coordinator for the Office of Environmental Health and Safety. Individuals wishing to run for any of the above positions must file by 5 p.m., Thursday, Oct. 16, in the Student Organizations Office, Suite B120, E.H. Hereford University Center. Voting is Monday-Tuesday, Nov. 3-4, in the University Center. Do you know a student or faculty/staff member who exemplifies The Maverick Way? Nominate him or her to receive the Maverick of the Month distinction. Nominations for October are due by Wednesday, Oct. 22. Contact Jennifer Fox at jdfox@uta.edu for more information. Visit the UTA Bookstore to obtain your regalia and other items for fall Commencement. Grad Finale is Monday-Thursday, Oct. 13-16, at the UTA Bookstore. Jostens will take orders for rings and invitations. Flash Photography will be available Tuesday and Wednesday only. Hours are 3-7 p.m. Monday-Tuesday and 10 a.m.-3 p.m. Wednesday-Thursday. At the end of the survey, enter the drawing for a $25 gift card, one awarded weekly for three weeks, and two $500 gift cards awarded after the survey closes Oct. 31. Deadline to include your name in the Commencement booklet for fall graduation in December. Many undergraduate students can view their midterm progress reports in their MyMav Student Center as soon as the grades are entered. Most grades will be entered on or by Tuesday, Oct. 14, although some faculty enter progress report grades later. Check your UTA email account to see if you will receive midterm grades, then meet with your academic adviser to discuss your progress and explore campus resources. Finalize your privacy setting in MyMav by Friday, Oct. 24, to have your name included in the printed souvenir Commencement booklet. The privacy setting in MyMav on that date will be used to determine if your name is included in the Commencement booklet for fall graduation in December. Undergraduate students who entered college for the first time in fall 2007 are limited to a total of six dropped courses during their undergraduate career. Discuss the impact of this when you meet with your adviser about dropping a course. Read more about this six course drop limit. A list of academic advising offices is online. The schedule of classes is not final. Plan to validate your course selections when registration opens. Priority registration opens Monday, Nov. 3. Music Honors Recital Performances by outstanding music students and faculty. Free. 7:30 p.m., Irons Recital Hall, Fine Arts Building. Music. Afternoon Variety Showcase Magician Joel Meyers performs. Free. 11 a.m., Palo Duro Lounge, E.H. Hereford University Center. EXCEL Campus Activities. Comic Potential A romantic comedy that raises questions about the nature and purpose of comedy, the necessity of love, and what it means to be truly human. Right, Emily Burgardt, C.C. Weatherly, and Michael Carver-Simmons. Tickets. 8 p.m., Mainstage Theatre, Fine Arts Building. Also, 8 p.m. Thursday-Saturday, Oct. 16-18, 2:30 p.m. Sunday, Oct. 19. Theatre Arts. Guest Bassoon Recital Jeff McCray of the University of Nebraska performs. Free. 7:30 p.m., Irons Recital Hall, Fine Arts Building South. Music. Ballet Folklorico Mexico 2000 Ballet Folklorico performs. Free. 7-9 p.m., Rosebud Theatre, E.H. Hereford University Center. Multicultural Affairs, Hispanic Heritage Month. LunaFest Film Festival Films directed and produced by and for women. A short-short film, Rubies, by alumna Lizette Barrera, BFA '13, included. Tickets $5 students, $10 others; $10 at door. 7-9 p.m., Lone Star Auditorium, Maverick Activities Center. Proceeds benefit the Breast Cancer Research Fund. Women's and Gender Studies. Student Films on 'Frame of Mind' Three short films by UT Arlington students Jean-Patrick Mahoney, Julie Gould, and Gabriel Duran are featured on "Frame of Mind." 10 p.m., KERA TV. UT Arlington Wind Symphony Concert The UT Arlington Wind Symphony, conducted by Douglas Stotter, presents a concert of band classics. Tickets $6 students; $9 others. 7:30 p.m., Irons Recital Hall, Fine Arts Building. Music. Volleyball Mavericks vs. Arkansas State. Tickets $3. 6:30 p.m. College Park Center. Also, vs. Georgia Southern, Friday, Oct. 24. Athletics. National Day on Writing Create an eight-word story that starts "I am UTA because …” and add it to the story wall. 9 a.m.-4 p.m., Library mall. UT Arlington Libraries, Writing Center, English. International Food Fair Taste fare from around the world for International Education Week. 11 a.m.-2 p.m., University Center mall. International Education. The Big Event Fundraiser UTA's annual community service program receives 25 percent of proceeds. 5-9 p.m. Wednesday, Oct. 22, Potbelly’s Sandwich Shop, 1301 S. Cooper St. The Big Event. 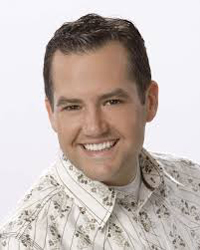 One Mic Stand Comedy: Ross Matthews Ross Mathews, right, presents "Straight Talk: LOL's and Advice from Your Gay BFF." Tickets $7 students, limit two; $15 others. 7:30 p.m. Thursday, Oct. 23, Bluebonnet Ballroom, E.H. Hereford University Center. EXCEL Campus Activities. Friday Night Film: 'How to Train Your Dragon 2' Rated PG. Free fresh-popped popcorn while supplies last; other concessions for sale. Tickets $1, $1.50 with credit card. 8 p.m. Friday, Oct. 24, Rosebud Theatre, E.H. Hereford University Center. EXCEL Campus Activities. American Jazz Composers Orchestra Concert Hear the music of The Rolling Stones performed by Dallas/Fort Worth's top jazz musicians. Dan Cavanagh, associate director of jazz studies and associate professor of music, serves as artistic director. $10; call Box Office at 817-272-2669. 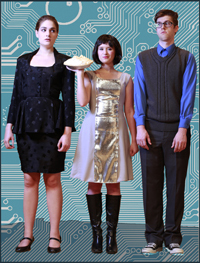 8 p.m. Saturday, Oct. 25, MainStage Theatre, Fine Arts Building North. Theatre Arts. University Center Gallery: Wings of Life Exhibit features works by Jeremy Schack, Janet Morrow, and Kourtney St. Clair. University Center Gallery, E.H. Hereford University Center. Through Friday, Oct. 17. Movin' Mavs Adapted Sports and Recreation, Disability Studies Minor. The Gallery at UTA: Philip Van Keuren and Liz Ward Philip Van Keuren presents atmospheric black and white photogravures. Liz Ward's work includes colorful watercolors and meticulous silverpoint drawings. Gallery hours 10 a.m.-5 p.m. Mondays-Fridays, noon-5 p.m. Saturdays. Artist talk with Ward, 12:30 p.m. Thursday, Oct. 16. Opening reception 5:30-8 p.m. Friday, Oct. 17. The Gallery at UTA, Fine Arts Building North. Through Nov. 15. The Gallery at UTA. Special Collections: The Price of Manifest Destiny Discover how maps and war interlock in the 19th century in a new exhibit. In conjunction with the Ninth Biennial Virginia Garrett Lectures on the History of Cartography, Thursday-Friday, Oct. 16-17. Hours 9 a.m.-7 p.m. Mondays, 9 a.m.-5 p.m. Tuesdays-Saturdays. UT Arlington Libraries Special Collections. Planetarium Open House Night free shows each Tuesday. Black Holes, Oct. 14; TimeSpace, Oct. 21; Stars of the Pharaohs, Oct. 28. The fall schedule includes Astronaut; One World, One Sky: Big Bird's Adventure; Pink Floyd; Spacepark 360 Infinity; Two Small Pieces of Glass; and We Are Astronomers. Planetarium. LaunchCode Information Session LaunchCode is a volunteer-run organization that helps people get jobs in the IT field. The program includes a free online Harvard training class and a two- to three-month apprenticeship. Register. Free. 6:30 p.m., Bluebonnet Ballroom, E.H. Hereford University Center. LaunchCode, Division for Enterprise Development. Biology Colloquium Series Joe Barrera, director of the Shimadzu Institute for Research Technology, speaks on "Quantification of Trace Estrogens in Serum by Bulk Derivatization and Direct Cation Exchange Trap-and-Elute LC/MS/MS." 4 p.m. Room 118, Life Science Building. Biology. Earth and Environmental Sciences Speaker Series Shaffiq A. Jaffer of TOTAL Corporate Scientific is guest speaker. Free. 4 p.m, Room 100, Geoscience Building. Earth and Environmental Sciences. Engineering Speaker Series Chris Singer, director of the Engineering Directorate at NASA's Marshall Space Flight Center, speaks on "Engine of Possibility: Exploration." Free. 5-7 p.m., Room 601, Nedderman Hall. Engineering. Ninth Biennial Virginia Garrett Lectures on the History of Cartography "The Price of Manifest Destiny: War and American Expansion, 1800-1865." See schedule. Register online. Central Library. UT Arlington Libraries Special Collections. Chemistry/Biochemistry Speakers Series Christopher Hobbs of Angelo State University speaks on"Polypropylene Based Oligomers as Synthetic Scaffolds Toward Supported Catalysts.” Free. 3 p.m., Room, 114, W. A. Baker Chemistry Research Building. Also, "Expanding the Chemical Toolbox to Probe Neuronal Signaling," Friday, Oct. 24. Chemistry/Biochemistry. First Aid/CPR/AED Workshop Cover the American Red Cross first aid basics, medical emergencies, injury emergencies, environmental emergencies, adult CPR and AED use. Register at the MAC Services and Information Desk. $50. Noon-5 p.m., Room 213, Maverick Activities Center. Campus Recreation. Service Learning Workshop Learn about what the Center for Community Service Learning offers and how to get involved. Free. Noon-1 p.m. Wednesday, Oct 29, Room 104, Preston Hall. Community Service Learning. Study Abroad Information Session Free. Noon-1 p.m. Wednesday, Oct. 29, Sabine Room, E.H. Hereford University Center. International Education, Study Abroad. Innovation Symposium and National Academy of Inventors Chapter Launch A TED-style symposium highlights research by UTA nominees of National Academy of Inventors Fellows. A poster session features research of faculty inventors. Afterward, a ceremony inducting UTA's inaugural class of the National Academy of Inventors. Register. Free; open to public. Innovation Symposium, 1-4 p.m.; NAI chapter launch, 4:45-8 p.m. Thursday, Oct. 30, College Park Center. Innovation Symposium. Improving Brain-injury Rehabilitation Through Infrared Imaging Georgios Alexandrakis, professor of bioengineering, describes using near-infrared light imaging to monitor traumatic brain injury as well as guide the treatment-mediated brain rewiring in children with cerebral palsy and adult stroke patients. Light breakfast provided. RSVP. Free. 7-8 a.m., Wednesday, Nov. 5, Room 100, Nedderman Hall. Arlington Technology Association. Tennis champs: Austan Pierce stretches for the ball during the ITA/USTA Intercollegiate Wheelchair Tennis National Team Championships last weekend at the UTA Tennis Center. The Movin' Mavs team won the national championship. 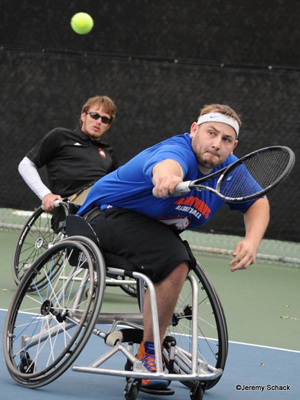 The Movin' Mavs wheelchair tennis team won the 2014 ITA/USTA Intercollegiate Wheelchair Tennis National Team Championships last weekend. The team hosted the competition at the UTA Tennis Center. Competing were teams from the University of Alabama and the University of Arizona. Andreas Kraft took the Tier 2 championship in singles. In doubles, Jeff Sale and Ricardo Lucien took third while Kraft and Juan Soto were fourth. Academic All-American honorees were Soto, Jeff Sale, John Watson, Austan Pierce, and Malcolm Wright. Other team members were Josie Aslakson, Morgan Wood, and Rose Hollermann. The volleyball team seeks its fourth win in a row when it faces Arkansas State at 6:30 p.m. Friday, Oct. 17, at College Park Center. A victory also would be the ninth straight win on the home court. The Mavericks claimed 3-0 wins over South Alabama on the road Friday and over Appalachian State at home Sunday. Sunday was also UTA's alumni match, with members of the 1989 Final Four volleyball team honored at intermission. Senior guards Lonnie McClanahan and Jamel Outler were named to the College Sports Madness/Sun Belt Preseason All-Conference Men's Basketball Team. McClanahan is a second-team selection. Outler was named to the third team. The National Fastpitch Coaches Association named UT Arlington softball sophomore Marisa Datko and former pitcher Callie Collins 2013-14 NFCA All-American Scholar Athletes. The men’s golf team began play Monday in the Miramont Invitational in Bryan. The final round began at 8 a.m. today, Tuesday, Oct. 14. The men's and women's cross country teams compete at the Pre National Meet on Saturday, Oct. 18, in Terre Haute, Ind. The postseason play includes the Sun Belt Conference Championships, Sunday, Nov. 2, in Mobile, Ala., and the NCAA South Central Regional, Friday, Nov. 14, in Fayetteville, Ark. The women’s tennis team competes in the ITA Texas Regionals in Waco on Thursday-Monday, Oct. 16-20, followed by the Wild West Shootout in Denton on Friday-Sunday, Oct. 31-Nov. 2. The men’s tennis team plays in the ITA Texas Regionals in College Station on Saturday-Monday, Oct. 18-20, then in the Florida Gulf Coast Invitational on Friday-Sunday, Oct. 31-Nov. 2. Upcoming entry deadlines for intramural sports include drop-in basketball, Tuesday, Oct. 14; fantasy basketball, Friday, Oct. 17; table tennis, Wednesday, Oct. 22, and badminton, Sunday, Nov. 2.